This DVD features a step-by-step breakdown of guitar styles and techniques. 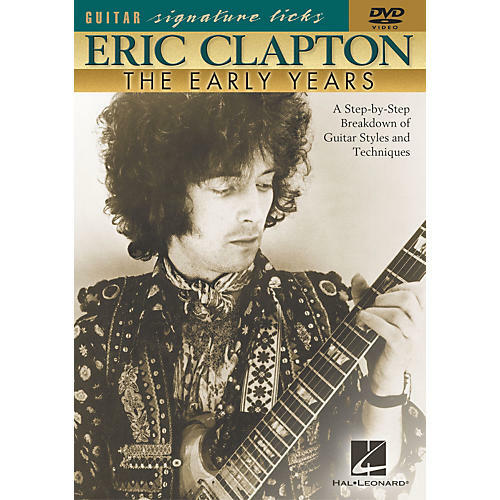 Learn the riffs and solos of Eric Clapton's early years with The Yardbirds, John Mayall's Blues Breakers, Cream, Blind Faith, and Derek and the Dominos! 8 classic songs are taught note-for-note: "All Your Love (I Miss Loving)," "Bell Bottom Blues," "Can't Find My Way Home," "Cross Road Blues (Crossroads)," "I Ain't Got You," "Layla," "Sunshine of Your Love," "White Room. Bonus features include: guitar techniques section, jam-along songs, practice tips. 63 minutes.